Generally speaking, healthy urine is clear urine. Of the many indicators of the body’s health, urine exists as a wonderful gauge. Not only does the color of urine indicate health, but so can the smell and consistency. However, expecting mothers may occasionally experience ‘cloudy urine’ pregnancy for a variety of reasons. These reasons range in severity; some can be treated simply at home while others will require medication or even close monitoring for the duration of your pregnancy. Let’s take a look at 6 possible reasons your urine could be cloudy early in your pregnancy. UTIs, or urinary tract infections, can cause urine to become cloudy. UTIs can result from a variety of reasons, including not urinating frequently enough; it’s important to always go when you need to—especially when you’re pregnant. Once diagnosed, UTIs can be easily treated with medication. Although this condition is more common during the second and third trimester, it occasionally shows up during the first. Proteinuria occurs when the urine contains high protein concentrations. Proteinuria can be an early warning sign of preeclampsia when accompanied by high blood pressure; this is a very serious prenatal condition that will require close monitoring for the duration of your pregnancy. The rising levels of hormones may cause cloudy urine. Your body begins producing the “pregnancy hormone”, or hCG, after the placenta forms. This hormone’s levels double every 2-3 days until approximately the 11th week, and then they level off. Some of these hormones will find their way into the urine and cause it to become cloudy. If hormones are the cause of your urinary change, it should resolve itself toward the end of the first trimester. Abrupt dietary changes can trigger cloudy urine pregnancy issues. Other foods, including dairy, orange juice, and asparagus may also cause cloudy urine. If you suspect foods may be the culprit, keeping a food diary and noting any urinary changes can be a good way to track if what you eat could be causing cloudy urine. Not drinking enough water—between 8 and 10 glasses a day—may cause cloudy urine as well. Dehydration often causes urine to be darker in addition to being cloudy. This cause is easily rectified; however, sometimes underlying medical conditions can cause dehydration, which would require medical intervention. Certain medications can also alter the appearance of urine. It’s a good idea to read all the fine print if you’re taking any medications to see if this could be a side effect. You should always alert your OB or midwife to any medications you’re currently taking so he or she can be on the lookout for side effects. Urine is most likely to appear cloudy early in the morning after remaining in the bladder throughout the evening. 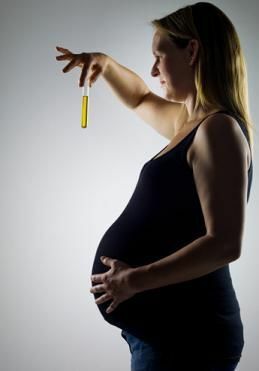 For cloudy urine pregnancy resulting from more serious conditions, such as infections, other symptoms are likely to pop up as well. If you experience cloudy urine accompanied by burning sensations, cramps, incontinence, a foul odor, or pain in the abdominal or back region, you should contact your healthcare professional immediately.